Add TO Cart. Support @ $15 Now. Add to Cart. Support @ $25 Now. Add to Cart. Support @ $50 Now. Add to Cart. Support @ $75 Now. Add Best of A.F.A.R. So Far CD-r to Cart. Buy CD Now. Raised to Date: $5350. Donor Thank You's. The concept of The Archive of Future Ancient Recordings is to involve fans of world fusion music in supporting the production of an archive of live and studio recordings that will be available to supporters as they are created. The best of these recordings will be selected to be released commercially at a future date, at which point they will be on their way to becoming "ancient" recordings! 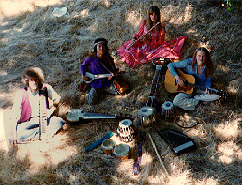 In late 1978, Ancient Future went into Tres Virgos Studio in Mill Valley to begin work on the first Ancient Future record, Visions of a Peaceful Planet, which was first released in May of 1979. During Ancient Future's 30th anniversary year, a new Ancient Future band project was conceived: The Archive of Future Ancient Recordings (A.F.A.R.). The A.F.A.R. goal is to kick start fan support for the world fusion music movement by giving fans a role in the process. That role will be similar to the financing and artistic feedback roles of the traditional record label, except that the fan community will have a lot more fun by being a part of a movement for an important cause rather than a for profit business. Fans of world fusion music place value on artistic quality and want to be part of a movement that can help build understanding between cultures. By involving more people in the process, we hope that this will help build support for virtuoso level cross-cultural music collaborations. 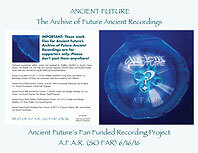 To finance A.F.A.R., Ancient-Future.Com Records is providing access to supporters to select files from Ancient Future's archives of studio out takes, live concerts and radio performances along with new recordings as they are created. The full archive of recordings will be available during the project exclusively to supporters, and when the archive is sufficiently stocked, a portion of the recordings will be selected for commercial release. As the recording progresses, a few digital singles will be released at major download sites to raise awareness of the project. Recording Newsletter Package: $15. Add to Cart. Support Now. Supporters at this level receive the A.F.A.R. Email Newsletter which provides a window on the creative process, good quality 128 kbps digital downloads legacy recordings chosen from the Ancient Future archives of live concerts, radio performances, and unreleased performances, good quality 128 kbps digital downloads of music to be recorded especially for the A.F.A.R. project, and a 30% discount on advance copies of the final commercial release. Until the Download Supporter Package is sold out, you can upgrade from this package at any time for an additional $15 donation (Upgrade Now). Be a virtual fly-on-the-wall during the recording process! Download Supporter Package: $25. Add to Cart. Support Now. Supporters at this level receive everything included in the Recording Newsletter Package plus high quality 320 kbps downloads of legacy recordings chosen from the Ancient Future archives of live concerts, radio performances, and unreleased performances, high quality 320 kbps digital downloads of music to be recorded especially for the A.F.A.R. project forming an exclusive preview audio recording with digital liner notes (selections from which will form a final public edition), and the chance to submit feedback to questions posed in the recording newsletter. Until the Limited Edition CD Sponsor Package is sold out, you can upgrade from this package at any time for an additional $25 donation (Upgrade Now). Limited to 300 packages. Limited Edition CD Sponsor Package: $50. Add to Cart. Support Now. Supporters at this level receive everything included in the Download Supporter Package plus CD quality downloads, and when the project is complete, an exclusive limited edition CD-R of the same recording with printed liner notes signed by Ancient Future leader Matthew Montfort (shipping and handling charges apply). Until the Honorary A & R Representative Package is sold out, you can upgrade from this package at any time for an additional $25 donation (Upgrade Now). Limited to 200 packages. Honorary A & R Representative Package: $75. Add to Cart. Support Now. Supporters at this level receive everything included in the Limited Edition CD Sponsor Package plus 24 bit hi-res audio downloads, and when the project is complete, a DVD-R including video and 24 bit audio files for hi-rez playback on computers (shipping and handling charges apply). This is the perfect package for audiophiles and home studio enthusiasts. Limited to 100 packages. VIP Donor. Make Tax Deductible Donation. You can also support the project with a tax deductible donation in the amount of your choice through Ancient Future's fiscal sponsorship with InterMusic SF, a 501(c)(3) Non-Profit Organization. On 6/16/16, six new pieces and a video made their debut in Archive of Future Ancient Recordings, bringing the total to 86 minutes and 51 seconds of music in the archive. 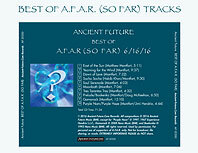 The archive will no longer fit on one CD, so we are offering a special very limited edition Best of A.F.A.R. So Far CD-R exclusively to supporters of the archive. Best of A.F.A.R. So Far. CD-R: $20. Sale $15. (Limited Edition, A.F.A.R. Subscription Required). Add CD-R to Cart. Buy CD-R Now. 71 minutes and 32 seconds long, this very full limited edition CD-R is available exclusively to supporters of the archive. To celebrate Ancient Future's 35th Anniversary February 11, 2014, Yearning for the Wind from The Archive of Future Ancient Recordings makes its debut on YouTube. It features scalloped fretboard guitar innovator Matthew Montfort and Indian tabla virtuoso Vishal Nagar, who is considered one of the most gifted tabla players of his generation. Born into a family of musicians, Vishal had his initial training with the late Ustad Latif Ahmed Khan of the Delhi Gharana, and received intense rhythmic training from his mother, the renowned and highly respected Kathak dancer and vocalist, Urmila Nagar. Upon his return from a concert tour of India with Zakir Hussain, Uzbeki master percussionist Abbos Kosimov absolutely rocked this March 7, 2013, overdub session. The video above is a quick little snippet of the unprocessed camera audio recorded from the back of the overdub room during a sound test. supporters get access to more exclusive behind the scenes content covering the making of A.F.A.R. !